It is better to be prepared before an emergency event and create a working relationship with a roofing contractor before the need for emergency repairs. But if you know Florida, you also know that bad weather or unexpected events can blow in at any time whether your prepared or not. These events could happen to your roof whether the emergency was a fallen tree or wind damage, leaks, or fire aftermath. When you need emergency roof repair, time is of the essence. Here are some tips to help you quickly act in an emergency. Damaged areas on your roof are susceptible to more damage. Protect your investment and prevent further damage by covering your roof with large tarps. 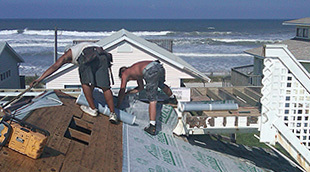 Most roofers and roofing companies will tell you that the cost of roof repair is typically less than roof replacement. Emergency repair needs are commonly the result of bad weather damage which should be covered by your insurance company. Some insurance companies require pre-authorization for tarping, in which case you'd call them and then a roofing contractor or roofing company. Most claims are time sensitive so keep that in mind as well. You can choose which roofer or roofing company assesses the damage and determines the cost of emergency roof repair (as well as the cost of a permanent solution). RDG Roofing services Deland, Deltona DeLand, Deltona, Orange City, DeBary, Daytona Beach, Ormond Beach, New Smyrna Beach and surrounding cities. Getting the tarp and boards off, and a protective roof on, is your first priority, so we make it ours. We plan with you short term protection for your home or building with tarping and roof leak repair and roof repair as well as long term solutions for the damage. Our customers typically work fast on insurance claims with companies such as Allstate, Amica Mutual Insurance, Liberty Mutual Group, MetLife, Nationwide, Progressive, State Farm, The Hartford, Travelers Insurance and USAA. If you're looking to find roofers in your area and you live in DeLand or Deltona as well as surrounding cities in Volusia county, put us on your list of roofing companies to call in the event of an emergency.